With the recent scrutiny placed on the Joint Commission (TJC) in publications like the Wall Street Journal, TJC has found itself on the defensive regarding its accreditations and how it holds hospitals accountable for safety violations. In response, TJC has been trying to open up a dialogue with the public about the importance of its mission and process when it comes to hospital accreditation. “Addressing deficiencies means directly resolving the issues or receiving a Centers for Medicare & Medicaid Services waiver to go beyond 60 days for resolving problems that need the additional time—such as constructing a fire-rated wall, replacing a fire-rated door or addressing inaccessible smoke and fire dampers, for example. 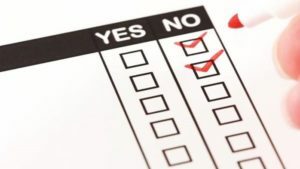 Hospitals face preliminary denial of accreditation if they don’t address deficiencies and document their improvements for us in one of these ways. These observations are the core and essence of our work: The accreditation process is about quality improvement — it’s not about “passing” a survey. Outside healthcare, there is a lot of misunderstanding about that. There’s a misconception that when adverse healthcare events happen, a hospital’s accreditation should be immediate[ly] revoked. The hard reality is that there are no perfect hospitals. No hospital, no accreditor, no government regulator can guarantee that adverse events won’t happen in any organization. When an adverse event happens or our surveyors find a deficiency, it’s important to remember that denying accreditation will not shut down the hospital. It will continue operating — usually without addressing the problem or finding out what caused the adverse event in the first place. Our job is to help that hospital make and sustain quality improvements so a similar adverse event doesn’t happen again. During 2016, 41 hospitals received a decision of preliminary denial of accreditation or time-limited preliminary denial of accreditation. Denying accreditation is a last resort, undertaken when a hospital over time has demonstrated an inability to resolve deficiencies and sustain improvement. Fortunately, all of the 41 hospitals that received preliminary denial last year accomplished all needed improvements were made to maintain accreditation. Why is revoking accreditation a last resort? We want hospitals to improve. I don’t think it’s unreasonable to say the public does, too. Leaving troubled hospitals to work out patient safety problems on their own doesn’t increase the chance they’ll do so successfully. It serves no one, especially patients and the communities they live in. We’ve Uncovered Problems. Now What? When a hospital has serious problems that put patients and staff at risk, state and federal agencies assess necessary regulatory action. Address challenges to implementing a sustainable solution. I am proud to work with The Joint Commission because we actively support accredited and certified hospitals and clinical programs in implementing changes that tangibly improve health care quality and safety. Is your hospital ready for your next accreditation survey, and the journey to continuous improvement. To prepare, hospitals have to make sure that they are following all of their detailed processes all of the time. Any breakdown in your processes would be put under the microscope by the TJC surveyor. Consider automation tools that help track the processes that TJC and other accreditation agencies focus on during their inspections. Systems such as iRIScope have been developed to ensure that processes and protocols are being followed since your managers can’t watch over every step of the way. The ECRI Institute, based in Philadelphia, has just released its annual list of health technology hazards for 2018. Unsurprisingly, endoscope reprocessing once again appears near the top of the list, coming in as the number 2 hazard for 2018. The cleaning step, which is largely manual and technique-dependent. If biologic debris and other foreign material is not cleaned from the endoscope first, residual soil can harden, making subsequent disinfection ineffective. Instrument storage after reprocessing. 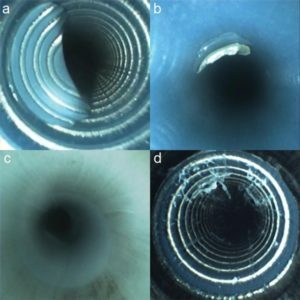 Moisture trapped in the channels of an endoscope can promote the proliferation of any microbes not eradicated by reprocessing. 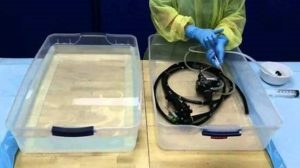 As the spotlight on endoscope reprocessing continues to shine, steps like visual inspection and channel drying help staff ensure that scopes are being disinfected to the highest possible standard. We must make sure that team members are performing the steps of the reprocessing cycle consistently and are documenting their findings along the way. If your department wants to automate the workflow and documentation process of the reprocessing cycle, consider a software system like iRIScope. Systems like these ensure that your staff are performing consistent, repeatable and documented steps during reprocessing. They also minimize manual efforts to document the process by incorporating advanced data collection technologies like RFID directly in to the workflow. The combination of modern verification techniques, like visual inspection and channel drying, with a highly automated workflow and data collection system, like iRIScope, is virtually guaranteed to set your staff up for repeated success. Is Your Endoscope Reprocessing Area Set Up For Success? Many hospitals continue to underestimate the importance of a successful endoscope reprocessing practice. Several hospitals and medical facilities that we’ve visited invest too little in facilities and staff to prepare their endoscopes after usage in procedures. However, if a hospital is unable to successfully ensure the cleanliness of these vital reusable instruments, they could be facing severe patient safety and financial risks. “The Healthcare Infection Control Practices Advisory Committee (HICPAC) is a federal advisory committee chartered to provide advice and guidance to the Centers for Disease Control and Prevention (CDC) and the Secretary of the Department of Health and Human Services (HHS) regarding the practice of infection control and strategies for surveillance, prevention, and control of healthcare-associated infections, antimicrobial resistance and related events in United States healthcare settings. CDC asked HICPAC for guidance on ways to improve facility-level training and ensuring competency for reprocessing endoscopes. HICPAC formed a multi organizational and professional work group, that as requested by CDC, produced a very intense and complete advisory document which was then published by the CDC in 2016. The HICPAC document listed the following eight key points that should be considered for the establishment of an appropriate work setting for the processing of endoscopes. Once you’ve ensured that your endoscope reprocessing area is suitably equipped, you’ll then need to turn your attention to your staff and processes. Make sure that your staff are adequately trained and certified periodically. Then make sure that your processes following best practices and are being adequately tracked via documentation. If your department wants to automate the workflow and documentation process of the reprocessing cycle, consider a software system like iRIScope. Systems like these ensure that your staff are performing consistent, repeatable and documented steps during reprocessing. They also minimize manual efforts to document the process by incorporating advanced data collection technologies like RFID directly in to the workflow. Visual inspection has emerged in recent years as an important quality assurance step during endoscope reprocessing. Updated guidelines from AAMI, AORN and SGNA have all included a visual inspection step during the disinfection process to ensure that scopes are being thoroughly prepared for the next patient. “What are the kinds of evidence you should look for before endoscopes proceed to high-level disinfection? According to the guidelines, the endoscope should be inspected visually for conditions that could affect the disinfection process such as cracks, corrosion, discoloration, retained debris, and poor fiber optic illumination. Other items to inspect for, as noted by AORN, are cleanliness, missing parts, clarity of lenses, integrity of seals and gaskets, moisture, physical or chemical damage, and function. The use of magnification and adequate lighting does help assist in the visual inspection process to identify these abnormalities. These are the common warning signs that the scope is in need of repair or additional processing. Other warning signs that an item may not be ready to be disinfected or sterilized are peeling of adhesives, cracks in lenses, brush gouge/scrape marks at the distal tip, stretched out covers on the bending section, and soil around or under the control knobs. Essentially, compare the scope to a new one and identify what is different. Then, evaluate if this could be a significant issue that may impact the ability of the scope to be cleaned, disinfected, or sterilized and could this be a risk to the patient? There are other more obscure warning signs that the endoscope may need more attention or that reprocessing procedures are not in a state of control. Things like moisture retained in the channel upon inspection with a borescope after disinfection would tell you that your drying processes are not adequate. Retained lint/fibers are also very commonly seen upon inspection with a borescope and would bring to light the possible practice that staff members are not using lint-free or low-linting clothes or sponges during reprocessing. Retained brush bristles would warrant investigating the condition of reusable brushes or the possible practice of reusing single-use brushes mistakenly. Internal channels that are heavily damaged by gouging or scraping may warrant taking a look at the physician practices with endoscope accessories, such as keeping the distal tip angulated while passing or removing a biopsy forceps. Use of a borescope for inspection of internal channels of the endoscopes is an additional step that may be taken to engineer quality into an endoscope’s reprocessing program. Both ST911 and AORN endoscope guidelines do highlight the process within their document. For example, AORN states that “Internal channels of flexible endoscopes may be inspected using an endoscopic camera or borescope. [2: High Evidence] Endoscopic cameras and borescopes penetrate the lumen and allow for improved visual inspection. Certainly, inspection of the internal channels with a borescope is a quality-driven process and will help a facility to assess the condition of their endoscopes, the overall reprocessing procedures and potentially the drying process. The one issue that is often raised with inspection with borescopes is when to perform this process. Many facilities inspect their scopes periodically after the disinfection process is complete and the scopes are in storage. If doing this, then the scope should be reprocessed again before use. By performing inspection at this stage in the process, a facility can assess their internal drying practices and clearly determine whether it is currently being performed adequately or not. According to SGNA, scopes must be completely dry prior to storage or should not be used on patients without being reprocessed again. Other facilities will inspect with a borescope after manual cleaning prior to disinfection or sterilization. Although this is an option, the scopes are highly contaminated at this point and completely wet internally. 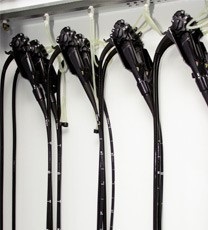 A complete drying procedure would need to be initiated after cleaning in order to inspect with the borescope. If not, all that will be seen is water, which is not helpful. 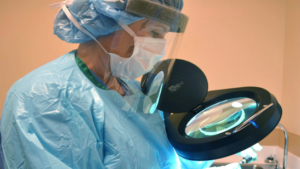 As the spotlight on endoscope reprocessing continues to shine, steps like visual inspection and cleaning verification help staff ensure that scopes are being disinfected to the highest possible standard. We must make sure that team members are performing the steps of the reprocessing cycle consistently and are documenting their findings along the way. If your department wants to automate the workflow and documentation process of the reprocessing cycle, consider a software system like iRIScope. Systems like these ensure that your staff are performing consistent, repeatable and documented steps during reprocessing. They also minimize manual efforts to document the process by incorporating advanced data collection technologies like RFID directly in to the workflow. The combination of modern verification techniques, like visual inspection and cleaning verification, with a highly automated workflow and data collection system, like iRIScope, is virtually guaranteed to set your staff up for repeated success. 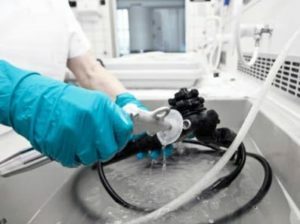 A new study into the cleanliness of endoscopes following high level disinfection has revealed some important findings. The research team, headed by Dr. Adarsh Thaker at UCLA, used specialized digital video cameras to perform visual inspection on 59 duodenoscopes, gastroscopes, echoendoscopes and colonoscopes after manual cleaning and high level disinfection. “Five expert endoscopists reviewed 97 videos and scored each for moisture, debris, stains or discoloration, scratches and channel shredding—damage that results in strips or filaments of the channel protruding into the lumen. All scopes were less than 3 years old, and during the study period 16 new devices were delivered to the unit. Even the new instruments were not immune to damage. “The most common finding in all our devices was scratches, followed in equal amounts by shredding and discoloration,” Dr. Thaker reported (Figure). Debris and moisture were also seen but to a lesser degree. All types of scopes revealed scratches (86%), shredding (59%) and discoloration (59%). Debris was observed less often (24%) and was seen in none of the colonoscopes. Although moisture and fluid were observed infrequently overall (8% of inspections), it was not uncommon in gastroscopes (36%) and colonoscopes (33%) and was not visible in duodenoscopes or echoendoscopes. Nor was simethicone evident. “Strikingly, the scopes that underwent forced air dry had zero evidence of visible moisture the next day, compared to five of 18 scopes that underwent overnight passive ventilation alone,” he said. Among the new devices, two of four new duodenoscopes and nine of 12 new echoendoscopes had visible scratches, and one of four new duodenoscopes and eight of 12 new echoendoscopes had shredding, according to Dr. Thaker. “None were found within two weeks of delivery, but between two and four weeks we had positive findings on inspection,” he said. No clinical infections were identified in his center during the study period. Whether the imperfections observed in this study present a risk for pathogens or infection remains unknown, he added. While endoscopes continue to be a focal point of safety issues for hospitals nationwide, both the manufacturers and the FDA believe that the scopes currently in market are usable as long as hospitals follow the manufacturer reprocessing instructions exactly. Hospitals that are concerned about staff adherence to instructions for use can turn to automation systems such as iRIScope to get better control of high-risk processes such as endoscope reprocessing. These systems improve staff compliance by standardizing processes and automating many of the data collection workflows. As endoscopes continue to be evaluated for their safety and risks of infection, hospitals must be diligent in their ability to consistently follow manufacturer cleaning instructions every single time to avoid potential litigation. Hospitals and healthcare providers are under increased scrutiny by The Joint Commission (TJC), the FDA, DNV and even Congress to improve the documentation practices around flexible endoscope usage. There are articles in the media seemingly every day about how an endoscope manufacturer or a hospital was cited, sued or otherwise put in a negative light around their endoscope practices. No hospital wants this and staff that work at hospitals don’t deserve this. The best way to defend against being put in a negative light, and to improve safety practices in general, is through making sure 3 best practices are in place: great processes, thorough training and high fidelity documentation. The key way to make sure that patient safety issues are minimalized or eliminated is through having well-documented and strictly followed processes. You have to strike the right balance in complexity – a process that is too simple may have holes in it that allow patient safety issues to surface, while a process that is too complex will be too hard for staff to follow. In addition to having great processes, thorough training for your staff must also be in place – for without trained staff, even the best-designed processes in the world will fail. This means that up front, new or updated standard operating procedures must be passed on through formal training and certification for staff. Staff should then be observed from time to time performing the process to make sure that all steps are followed correctly – any missteps should be immediately pointed out with advice on how to perform them properly. Also, re-training and certification for staff should be mandatory at least annually. High fidelity documentation eliminates concerns by surveyors and regulators, ensures staff are trained and following quality checklists and procedures, and provides data that can help your hospital improve operations over time. As a common saying goes – if processes aren’t documented, they’re not done. Any process needs to have simple documentation that is completed in real-time to verify that all proper steps have been taken, ensuring that processes are followed as designed each and every time. Also, this allows supervisors to find root causes or holes in the system if and when things break down. When it comes to documentation, we are seeing some hospitals are using their automated endoscope reprocessors (“AER”) as their scope documentation system. Though we applaud the move from pen and paper (and other methods) to an automated system, there are various reasons that this does not suffice if your objective is to increase safety and infection control conditions for your patients and your staff. The AER only tells you that a certain scope has been high level disinfected by the AER. It doesn’t tell you anything else about the cycle of the scope from storage, to use at the bedside, to pre-clean and all the other steps prior to reprocessing. Further, by being at the end of the cycle, it is difficult for team members in the scope area to know exactly which patient the scope was used on and at what time. Additionally, best practices today dictate that the enzymatic cleaner should be on the scope within one hour of use. An AER does not provide any such data or proactive alerts to your team. Missing this step creates a large risk of infection or worse for your future patients and team members. Hospitals are moving from more conservative 30- and 14-day hang-times (also known as shelf-life limits or out-date times) for scopes, to more aggressive 7- and 5-day hang-times across a large sample of hospitals that we’ve talked to recently – over 50% of hospitals are now at 14 days or less. An AER does not know which scopes have been removed for use or are still hanging ready to be used. No alerting or data is available for team members to eliminate issues. AERs are not connected to the IT and medical record infrastructure your hospital has invested in. The information in an AER sits in a silo and is often difficult to download and analyze. Data can be “dumped” into a data processing application like Excel, but from there all of the formatting and analysis must be conducted by someone in the department. This does not work when you’re trying to quickly investigate a possible patient safety issue or if Joint Commission drops in for an inspection. No doubt, AERs are great at what they are designed to do – automate the reprocessing of scopes. We applaud the improvement in reprocessing technology and the investment hospitals are making in constantly upgrading AER effectiveness. Let the AER do what it does best and let the hospital invest in an appropriate process to document the entire lifecycle of the scope. If your hospital has objectives to deliver the highest quality of care, safety and performance, a world-class AER should be part of the overall strategy. It should not be the entire documentation system. It leaves too many holes in the data, it requires a lot of manual data entry, it makes it difficult to analyze the data, and it doesn’t provide information about the entire lifecycle of the scope. Mobile Aspects’ iRIScope system is a best-in-class software system that uses RFID technology to automate the documentation process for the entire endoscope lifecycle. This ensures that all processes are well-documented, standard operating procedures are followed as designed, and potential safety or operational issues are sent to administrators via real-time alerts. The system also has optional RFID smart cabinets that add another layer of security and oversight to your expensive endoscope inventory. Having a state-of-the art software system is a best practice for meeting the increasing scrutiny in scope management being brought by regulatory agencies, driving quality procedures and checklists with your staff, and improving operations over time. That is an improvement in quality we can all be proud of. The United States Food and Drug Administration (FDA) recently cleared the first duodenoscope with a disposable distal cap. It is believed that the new feature will improve access for cleaning and reprocessing of duodenoscopes, leading to improved patient safety. The Pentax model ED34-i10T duodenoscope is being released following a field correction issued earlier in 2017 by Pentax, which warned of potential safety issues with existing Pentax duodenoscopes. Duodenoscopes are used in more than 500,000 procedures each year as a less invasive way than traditional surgery to drain fluids from pancreatic and biliary ducts blocked by cancerous tumors, gallstones or other gastrointestinal conditions. The flexible lighted duodenoscope, which is threaded through the mouth into the top of the small intestine, is a complex medical device with many small working parts that can be difficult to clean. If not thoroughly cleaned and disinfected, the device can trap contaminated tissue or fluid in its crevices, transmitting infections between patients. The infection risk with duodenoscopes across all the major scope manufacturers continues to be an issue for hospitals. Hospitals must continue to be vigilant in their use of duodeonscopes and consider new advancements such as the Pentax ED34-i10T duodenoscope. Where strong processes are missing, hospitals must work to ensure the proper people and systems are in place to make sure processes are being followed exactly as designed. Systems such as iRIScope have been released in recent years to help hospitals and healthcare facilities ensure the highest levels of compliance and standardization when it comes to endoscope reprocessing. Are Public Inspection Reports Coming? Following the Wall Street Journal article that questioned the validity of The Joint Commission’s accreditation practices, the government has stepped up inquiries into the hospital accreditation process. The Joint Commission, as the largest accreditation agency, is now under increased scrutiny and hospitals may be exposed as a result. “In his letter to CMS Administrator Seema Verma, Grassley brought up the Wall Street Journal report that gave examples of the Joint Commission’s failure to hold hospitals accountable for safety violations. “The Joint Commission appears to be unable to aggressively enforce the necessary standards on all facilities,” he wrote, noting that the newspaper reported 30 incidents in which hospitals retained their full accreditation even though CMS deemed the violations so significant they were likely to cause a risk of serious patient injury or death. “Making facility inspections reports public may go a long way to providing the necessary additional information for patients and their families to make informed decisions about where to seek care,” he wrote. Grassley asked for a CMS response by Oct. 2. Joint Commission spokeswoman Elizabeth Eaken Zhani told FierceHealthcare on Wednesday that the accreditor “steadfastly supports putting valid, useful data on quality of care in the hands of the public” and has been doing just that for more than 20 years. Is your hospital ready for your inspection reports to be made public? This may be an inevitability now that the focus has been put on The Joint Commission by Sen. Grassley. To prepare, hospitals have to make sure that they are following all of their detailed processes all of the time. Any breakdown in your processes would be made public via an inspection report, putting your hospital’s reputation and finances at risk. Consider automation tools that help track the processes that The Joint Commission and other accreditation agencies focus on during their inspections. Systems such as iRIScope have been developed to ensure that processes and protocols are being followed since your managers can’t watch over every step of the way. This is part of a series of interviews being held with professionals who have deep expertise in the requirements and protocols around endoscope reprocessing in hospitals. The goal is to learn about and educate on existing and emerging best practices in endoscope reprocessing. I had a chance to sit down with Jhmeid Billingslea, the Director of Surgical Support Services at Children’s Healthcare of Atlanta (CHOA). We walked through the set up and the endoscope reprocessing protocols across the multiple CHOA campuses that he oversees. Jhmeid has over a decade of experience in surgical services at CHOA, and has been a subject matter expert for IAHCSMM. 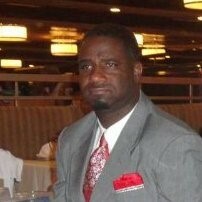 He started out as a military surgical tech and has also been a college professor in health sciences. 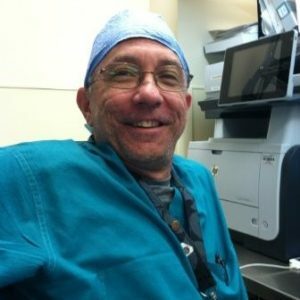 His deep knowledge of CHOA’s surgical services and previous experience as a professor and subject matter expert make Mr. Billingslea uniquely qualified to give us useful insights into his scope operations. How many scopes does your department manage the reprocessing of? We manage 147 scopes across Children’s Atlanta. I know that number by heart because scope inventory is one of the biggest things that we’re trying to manage. We have such a large inventory that sometimes resources aren’t available when we need them. We’re trying to integrate all of the areas across our campuses, and so far we’ve standardized our cleaning processes across the organization. What brand(s) of scopes do you use at your facility? We mainly use Olympus, followed by Karl Storz, and a couple of Pentax and Fujis. What EMR are you on? We have Epic OpTime. And we use Provation Medical for GI. And they’re integrated. How many AERs do you have? We have 7 Medivators Advantage AERs spread across our facilities. We’re doing a construction project now and we’ll be bringing in another type of Medivators reprocessor. Where are the scopes stored after reprocessing? Scopes are dispensed out to the area where they’ll be used. The OR scopes are kept in house and there’s a separate special procedures area where the GI scopes go. The scopes for Anesthesia and others like ENT are distributed to where they’re used. We actually are sterilizing about half of our scopes each time they’re reprocessed, and these ones we keep coiled in the container. The other half of our scopes hang freely in storage and we sterilize those every 3 months. What is your scope hang-time/end-of-life limit? We stick to a 7-day hang-time limit. How do you track the scopes to make sure they don’t surpass the hang-time limit? We have a color coding system that we monitor with visual inspection. We have a different color for each day of the week, so we know which scope needs to be pulled based on the tag color and the day of the week. We’re looking forward to our instrument tracking system from SPM Microsystems being expanded to cover more of our scope information. Things like hang-time we’re planning to track through there. How do you know when a scope is ready to be picked up after use? The personnel in the room transports them to the dirty room downstairs, or to the endoscope reprocessing area. They’ll send us an alert when they’ve put them on the elevator down to SPD. How do you track who is washing which scopes and make sure that all steps along the way are completed and documented? The Medivators Advantage system stores that info for us. We don’t have an interface to monitor it, but we’re able to pull it out as needed. How do you track which scopes were used on which patients? With Epic and Provation being integrated, we have a good view into which scopes were used on which patients. How do you track which employee took out which scope from clean storage? Clinical staff is documenting who took the scopes out for the most part, but we don’t really have a way to track who is taking them out. At one of our campuses, we have a manual log that they use to log scopes in and out, but our other campuses don’t have a log. We’re actually trying to get rid of that log because the compliance rate with people filling it out is so low. You’re better off having no log than one that can’t be relied on. This is the first in a series of interviews being held with professionals who have deep expertise in the requirements and protocols around endoscope reprocessing in hospitals. The goal is to learn about and educate on existing and emerging best practices in endoscope reprocessing. How many scopes does your SPD department manage the reprocessing of? We have 44 scopes spread across our GI and OR departments. We actually just purchased 2 more and we’ll be having more coming in soon. We’re doing almost all Olympus scopes. We do have 2 Ultrasound Probes coming in from Pentax. We’re doing most of our scopes in the Medivators Advantage AERs. We also have a Steris 1E for our Duodenoscopes. We have 3 different locations where our scopes go for clean storage before they’re used in a procedure. Right now, we have scopes in Endo, the OR and ICU. We have a 7 day out-date time for our scopes before reprocessing. We started at 12 days, and SGNA is saying 7 days. We have a lot of conversation around this internally. We’re looking to work it back up to 14 days. And we’ve been talking about the IAHCSMM guidance around visual inspection as well. We’re in charge of watching over the OR scopes. We have a tag system that says the out-date time, and we’re looking at those daily. We have a system where a transporter will bring the scopes to us after a procedure. If there’s a staff member who happens to be close by, they can also grab it and bring it over to SPD for reprocessing. We do yearly competencies and semi-annual competencies with each of our SPD team members. We also require 5+ years of experience for each employee. We then make sure to follow the IFUs as closely as possible and use only manufacturer brushes. We also make sure to do a visual inspection after each hand cleaning. We just recently found 4 scopes in 4 days that needed to be sent back to repair from the visual inspections. Personally, I also put in some face to face time to ensure the team is working properly. I’ll do an occasional observation of each of my team members. I’ll look at the infection report as well that our infection control team is putting together. Our AERs print out a ticket after each reprocessing. We then keep a log sheet that ties the tickets to the patient stickers. We keep those logs on site for at least a year before sending them down into storage. We don’t currently have a system to track which scope is taken out by whom. We’re thinking about using our instrument tracking system, SPM, for that purpose, but we’d like to have an integrated system.